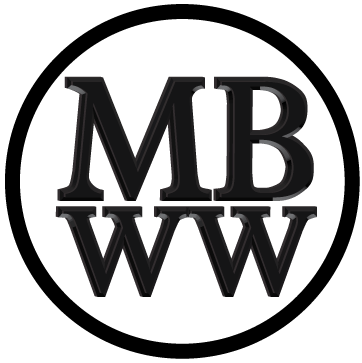 Normally I do not get too enamored over microbrand dress watches because there are so many of them out there and they tend to look similar. There are some standouts, however. 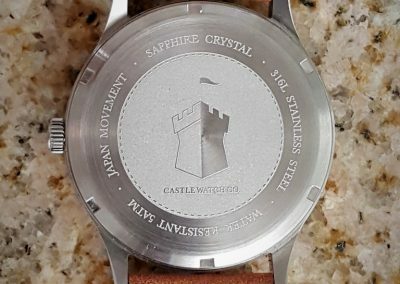 Castle Watch Company from Northern California was started by two friends and it got up and running on Kickstarter in 2016. 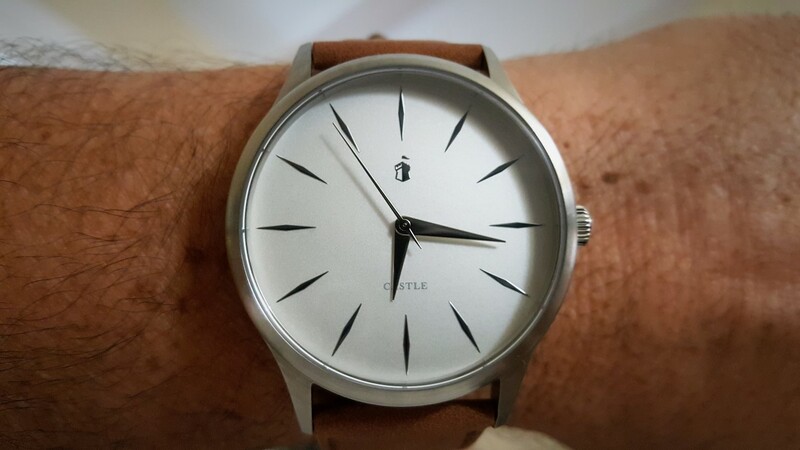 Currently Castle offers nine models of it’s Corbel S12 dress watch. The watches are built with a Japanese made Miyota 2035 quartz 3 hand movement that is specified to have a decent 3 year battery life. My example has been less than 2 seconds a day fast and it has the typical slight second hand misalignment common to quartz movements. 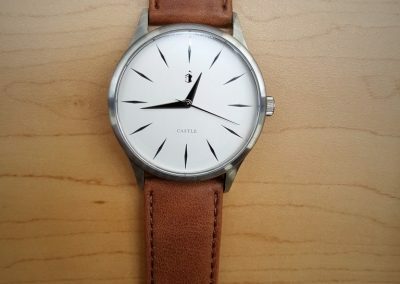 This watch has no second hand shake at all. The watch case is completely 316L brushed stainless steel with a slightly raised, flat, beveled edge sapphire crystal. The bezel has a well machined edge where it meets the case and also where the case meets the case back. 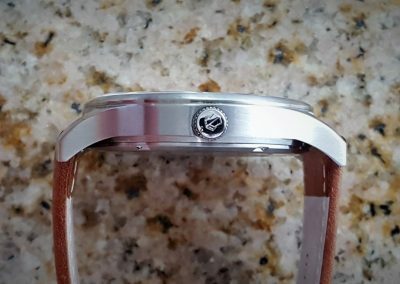 Water resistance is rated at 5 atm and the case back is surprisingly laser engraved and screw down. All 12 indices on the off white face are raised flat polished elongated trapezoids with matching flat and polished (and fairly short) dauphine hour and minute hands with round tails. The needle like second hand is finished with a matching tail. 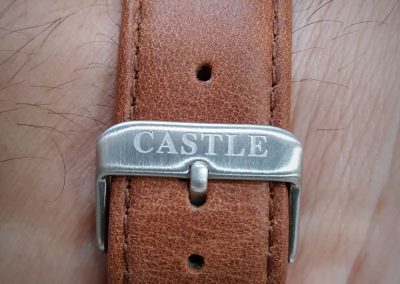 A small polished Castle logo appears on the upper half of the face with the name “CASTLE” discretely printed in silver on the lower half of the face. 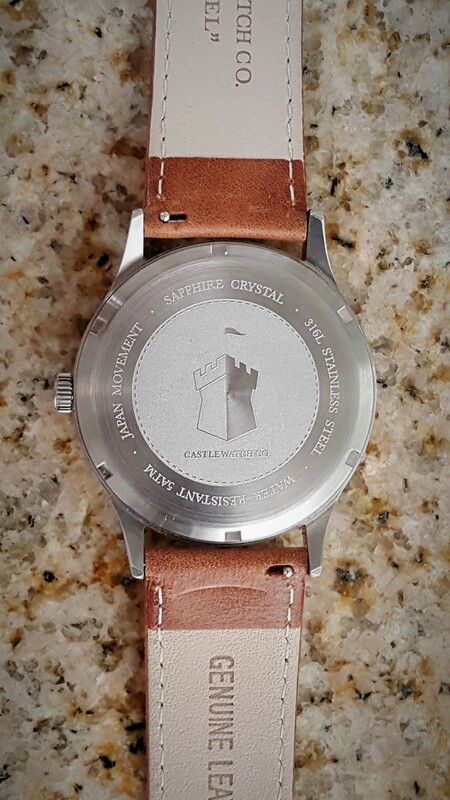 The case is 42mm in diameter, less than 10 mm thick, with a 5.5 mm diameter by 2.5 mm gear edge signed polished crown, that is properly proportioned to this case. The case is 50 mm lug to lug and 22 mm between the lugs. The 8 hole, stitched, tapered quick release walnut finished leather strap has one fixed and one sliding loop, as it should. The strap starts at just under 22 mm wide at the lugs, tapering down to 19.5 mm. 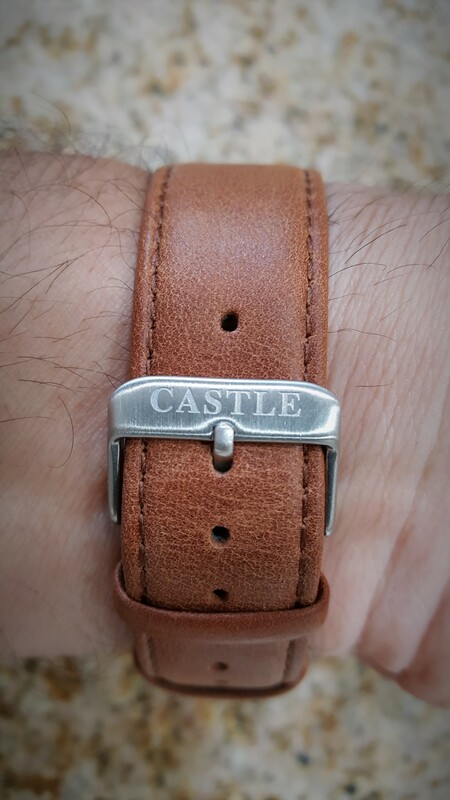 The properly sized (as in not too large) signed stainless steel brushed buckle works perfectly with this strap. The watch also comes with a matching black leather strap. 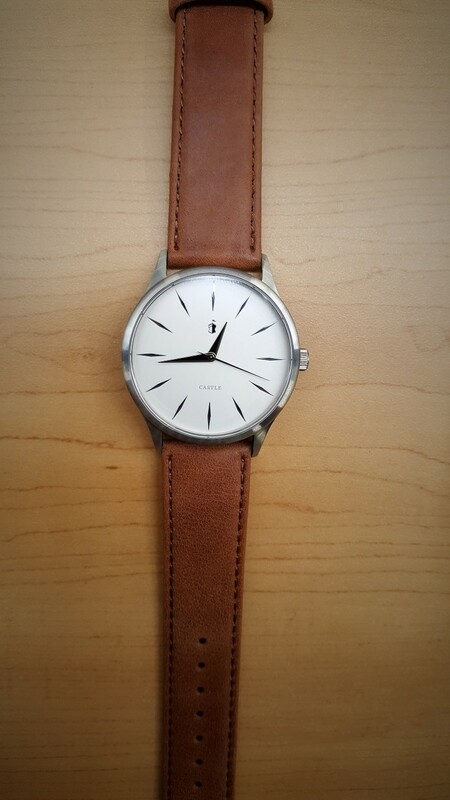 This is not a small dress watch, but it is not huge either. 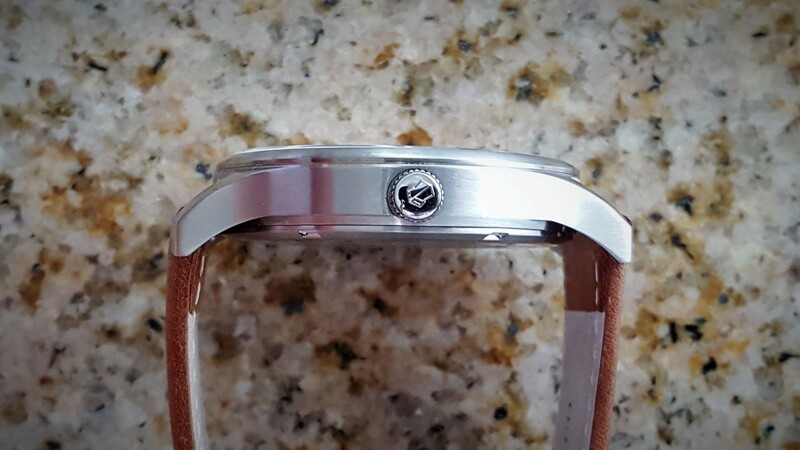 The nicely downturned lugs help keep this watch close to my 7 inch wrist and it is very comfortable to wear.